National Two South league leaders Cinderford meet Bury St Edmunds this weekend with the Gloucestershire side on the verge of clinching promotion to National One. Paul Morris’ men require just three points from their final two matches to be crowned champions and they can achieve that target this weekend when they travel to Suffolk. But, the Wolfpack will be out to spoil Cinderford’s party while second placed Chinnor will be aiming to continue their fine form when they take the trip to Canterbury. Down at the wrong end of the table, relegation-threatened sides in National Two South will be looking for much-needed wins in Round 29. This weekend sees two teams who are fighting for survival go head-to-head as Wimbledon host Old Redcliffians while Barnstaple and London Irish Wild Geese will be aiming to overcome their respective challenges against Worthing Raiders and Henley Hawks. Elsewhere across the division, Redingensians can cement third place with a win away at an in-form Clifton while Taunton Titans take on Tonbridge Juddians and Redruth entertain Broadstreet at the Recreation Ground. Cinderford are nearly there. The National Two South league leaders require just three points from their final two matches of the campaign to secure automatic promotion to National One and they can clinch the title this weekend when they travel to Bury St Edmunds. The Foresters have won 22 matches on the spin and lost just once this term and their amazing consistency means they are now on the verge of a place back in the third tier after a two year absence. Director of Rugby Paul Morris told us this week that his side are purely focused on the challenge Bury pose and he is right not to dismiss the hosts after they nearly beat second placed Chinnor away from home last Saturday. A late penalty try denied Jon Curry a third consecutive victory and since his arrival, the Wolfpack have continued to impress. Their target is certainly a top six finish and a victory in their final home game of the campaign could see them move up to sixth and delay Cinderford’s promotion party. Chinnor’s aforementioned victory against Bury St Edmunds was the kind of character which we have come to expect from Matt Williams’ side over the last two months. Defeat to Cinderford back in January was a huge blow to their title chances, but the Black and Whites have not let that affect them and they head to Canterbury in Round 29 having won their last eight fixtures. Not only has that kept the pressure on Cinderford, who are eight points clear at the summit, but more importantly it secured Chinnor second spot so they will be aiming to maintain their excellent recent form which they can then take into their National Two play-off match. Hoping disrupt Chinnor’s preparations will be Canterbury. The City Men pitted themselves against third placed Redingensians last week and considering Andy Pratt’s side were riddled with injuries, they were still able to pick up a bonus-point from their travels. Now, Canterbury will have to produce another spirited display and with a top half finish still achievable, a second home win on the spin could edge them closer to that target. Third place almost belongs to Redingensians. The Rams continue to improve as each season goes by in National Two South and finishing in the bronze medal spot this year would be a superb achievement for Seb Reynolds’ side. The Berkshire club require just four points from their last two games to secure a top three finish and their battling win over Canterbury last week showed just how much the men from Old Bath Road what to achieve that goal. It has been a remarkable rise since Redingensians were promoted into this division in 2015 and something which has also been excellent is Clifton’s recent turnaround in fortunes. They host the Rams this weekend after securing safety in Round 28 following an excellent win over London Irish Wild Geese away from home. It is now five wins on the spin for Darren Lloyd’s men and considering they had won just six games in 23 matches, it just shows how brilliant the Lavender and Blacks have performed over the last month. With their place in this division now confirmed, they will certainly enjoy their final home fixture of the season this weekend. 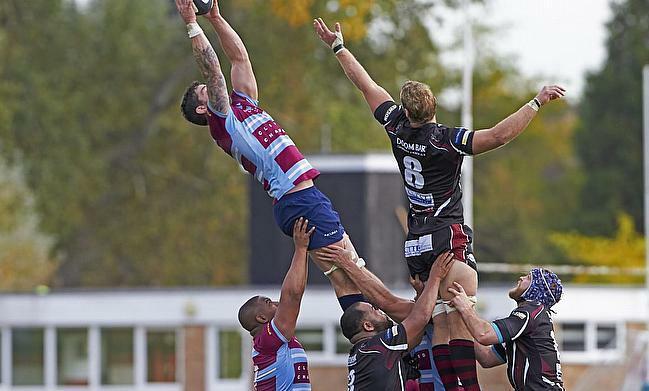 Last Saturday, Taunton Titans’ aims for a top three finish in National Two South suffered a blow as they lost out to Cinderford at Dockham Road. Tony Yapp’s side are now seven points off third placed Redingensians and if the Rams beat Clifton this weekend then fourth is the highest the Titans can finish this term. It has still been another strong season for the men from Somerset, but a block of poor results has once again cost Taunton a chance of finishing in the promotion places. However, they will be challenging again next year and their immediate aim will be to pick up a win in their final home game of this current campaign when they host Tonbridge Juddians. TJs bounced back from a disappointing defeat against Wimbledon by beating Redruth in Round 28 which has given them a great chance of finishing in the top six this term. It has been an excellent campaign for Peter Dankert’s side following promotion 12 months ago and if they were to end this year in sixth place, then that would be one of the stories of the season in National Two South. Redruth battled well to come away from Tonbridge Juddians with a bonus-point in Round 28, but it was once again a defeat for Pale Nonu’s side. The Reds were in the mix for a top four finish at one point, however four straight losses means Redruth can only end this campaign as high as fifth place. Overall, it has been a positive season for the Cornwall based-side and one of the highlights of their term has been their performances at the Recreation Ground. The Reds have lost on just two occasions at home this season – both defeats coming against Cinderford and Chinnor – so the odds are firmly in their favour when they host already relegated Broadstreet. The Midlands club will be hoping to enjoy their longest away trip of the campaign after a really tough season back in National Two. Street had their relegation confirmed at the start of the month, but head coach Cliffie Hodgson has vowed that his side can bounce back from this disappointment and with preparations already beginning ahead of next season, a win at this level would be a good way to round off a difficult year. Last week, Henley Hawks slipped to their third defeat on the trot as they lost a thrilling 16-try contest with Worthing Raiders. It has been a frustrating conclusion to the season for Pete Davies’ side as the Hawks come into their final home game of the campaign having won just one of their last eight fixtures. Hopes of a top five finish are over, but Henley will want to end the term in the top half of the table and victory at Dry Leas against London Irish Wild Geese would edge them nearer to that aim. However, while Henley might not have much to play for, their visitors are desperate for the points. London Irish Wild Geese fell into the bottom three last weekend following a defeat to Clifton and just one win in six matches – coupled together with the upturn in form from their rivals – has left Lee Starling’s men two points from safety with two games left to play. After this fixture, Wild Geese host Worthing Raiders, but their fate can be sealed this weekend if they lose in Oxfordshire and other results go against them. One of the fixtures which London Irish Wild Geese will have an eye on is Barnstaple’s home clash with Worthing Raiders. The hosts are in the final safety spot in National Two South, but a defeat to rivals Old Redcliffians in Round 28 has left them embroiled in a fight for survival for the second year in a row. Barum have won just one of their last seven games and that form has sucked them into this relegation scrap with two games to go. Twelve months ago, Barnstaple were competing alongside Worthing Raiders to stay in this division, but it is a different story for the Raiders time around. Worthing clinched their 10th home win of the campaign last week after beating Henley Hawks and the men from Roundstone Lane now have a top eight finish in their sights. Worthing are just two points off that goal at the moment and a third away win of the campaign could see them move into eighth place. We should be in for a treat this weekend as two sides fighting for survival clash in South-West London as Wimbledon take on Old Redcliffians in one of the matches of the season. For the visitors, their remarkable revival continued last week as a fourth win from their last five games saw them move out of the bottom three and now they are two points clear of the drop zone. For the first time in a while, Old Reds’ fate is in their own hands and two more wins would clinch their place in this division for another year. If Saul Nelson’s side were to achieve this, it would be a remarkable feat but if their hosts Wimbledon were to avoid relegation, then it would be a staggering escape. The Dons are currently seven points from safety so they must avoid defeat this weekend if they are to take their battle for survival down to the final day of the season. Beating the drop is certainly doable for Wimbledon as they take on fellow strugglers Barnstaple next weekend, but if that game is to hold any significance, they must get a result at Barham Road this Saturday.